You mean I have 12, TWELVE houses? And here I thought I was poor. Wow, what real estate! What can I do with all my houses? How are these assets best used? Can I sell one of my houses? 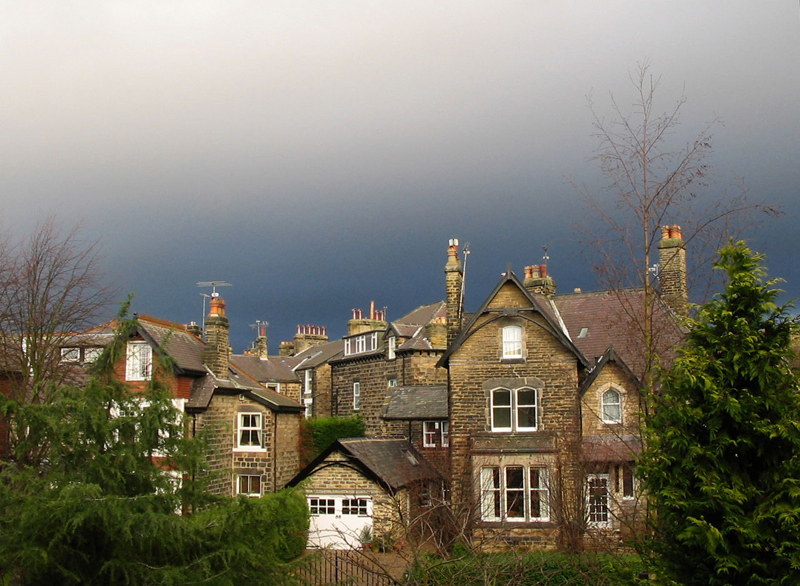 What are these houses worth? Do people live in my houses? Am I a landlord or do I spend time moving around my houses — living, doing, and experiencing different things? 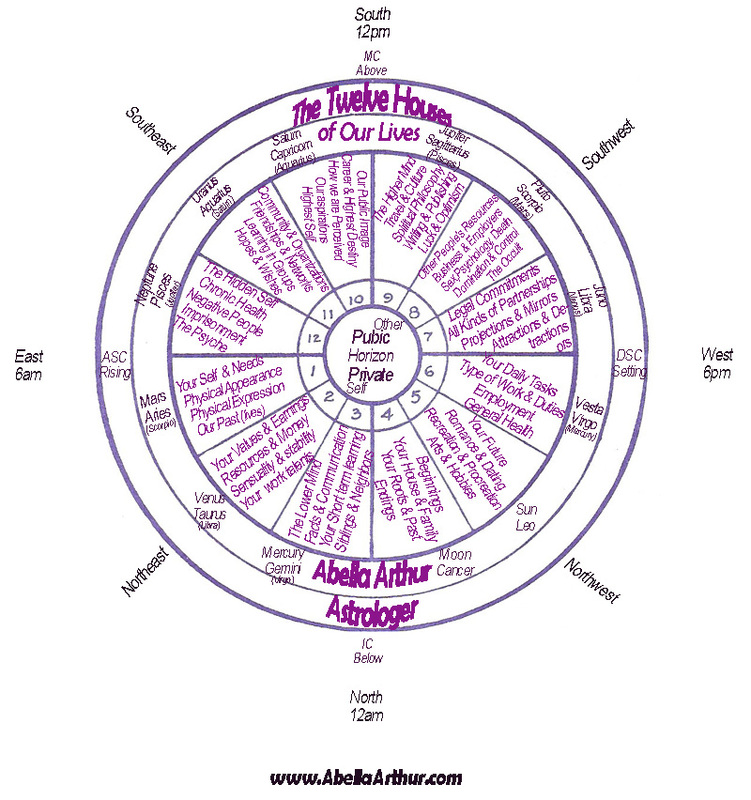 …Lets take a look at what it means to have 12 houses, in astrological terms. In astrology, everyone has 12 houses. How is that for equality? Oh that would be too easy. Not all things are equal, are they? Some of us live in the same area but our neighbor can have a bigger house than we do. And they may do more things in their house or be rarely home. Or maybe we need to do a lot of repairs on our house but a friend of ours seems to never have anything wrong going on in their home. The figure below is a physical representation of our inner and outer world. This is your zodiac wheel and it’s part of your natal chart. This wheel can be used for many purposes; however, in this article I discuss its use for reading a birth chart. Each house helps answer basic questions about your life: Why? How? When? Who? What? Where? Each house of the zodiac represents a part of our human lives that we play out. These parts are things we all experience in one way or another. Each house has a natural planetary ruler. I see the planets as having plans for us and the signs carry out those plans. You can have an empty house or you might have a full house (called a house or sign stellium). And no, there’s nothing wrong with that. A pattern (connecting key houses) is revealed based on where the planets lay in your particular natal chart. A sign cusp and/or a sign (connected to a celestial body or point) within a house can represent an actual person. That’s a spooky thing to discover. A house is contained within two straight lines and forms a wedge. To determine the sign on the cusp ( house cusp) look at the sign that starts the line going from left to right (counter clockwise) from the inner circle. I read geocentric charts. This is where the native (The Sun) is placed in the center. As the Sun casts its shadow, East becomes West and West becomes East. North becomes South and South becomes North. The upper half of the wheel (above the horizon) is where the native will feel comfortable sharing themselves with others. The bottom half of the wheel (below the horizon) is where the native is protective, insular, and often uncertain. The upper half is where we strive to go outside of ourselves and where we learn about ourselves. The bottom half is where we go within ourselves and what we or our family and heritage teaches us about ourselves. The east side is about us and the west side is about others. Are you more of a ‘me’ person or an ‘other’ person. Do you feel more responsible to yourself or others? We can read the chart as Public Other, Public Self, Private Other, and Private Self. Any celestial bodies or points near the angles (ASC, IC, DSC, and MC) intensifies the house objectives. Law of Proximity: The 1, 12, 6, and 7th houses will contain a mix of public and private approaches. Vacillating back and forth with what we share publicly or privately. The 3, 4, 9 and 10 will contain a mix of self and others. Vacillating back and forth with what we share with self and other. What’s in or on (cusp) our house, holds the key to knowing: How, why, where, when, what and with whom? Since everyone has a 3rd house and *third house themes, that means everyone communicates. So lets say you have Pisces on the 3rd house cusp. Pisces is ruled by Neptune and Neptune handles the affairs or office of illusions, magic, mystery, the intangible, the soul and spirit force, etc. Neptune is the higher vibration of Venus (Taurus, Libra — the arts, music, etc.). What plans does Neptune have for you? How does Neptune want you to conduct yourself ? How will you carry out Neptune’s plans in how you think? How would you communicate with Pisces on your cusp? Well, you probably wouldn’t be exceptionally clear but that wouldn’t be on purpose. And you would probably be quite poetic and magical in your expression. Maybe you could be a poet or a singer? Or perhaps you communicate through vibrations, telepathy, or feeling. Maybe you enjoy playing and sharing music. Possibilities are endless. What about if you have Mars in your 3rd house and its sign is Pisces? How would that color what was just talked about? For starters, Mars rules Aries (and Scorpio). It’s a strong and forceful planet. It knows what it wants and it doesn’t stop until it gets it. It’s very ‘me’ oriented and not always fair, though it does try (at face value, anyway). Mars naturally rules the first house and by sign rules aggressiveness, assertiveness, doing, sexuality, masculinity, extroversion, etc.. But when Pisces is in the 3d house (unless an interception is occurring), Mars is probably ruling the 4th house. So we would say Ruler of the 4th is in the 3rd. Given Pisces tends to be a soft, watery, feminine, and introverted sign — it doesn’t match up so well with fiery Aries. In this case, perhaps this native is most comfortable communicating and verbalizing quite strongly, in the home environment or with their parents (especially the Mother). Perhaps the native comes off as ‘dramatic’ and whiny or strongly artistic in their expression. Or maybe they get into fights with siblings but don’t know how to get their feelings across in the best way to resolve conflicts. To add another piece to the puzzle, the opposite ‘thinking’ house to the 3rd, is the 9th and Jupiter (Sagittarius) naturally rules it. In this case, the native has Pisces on the 3rd (naturally squaring, by sign, Sagittarius but co-ruled by Jupiter), so Virgo is on the 9th. Virgo’s natural rulers are Mercury (3rd house) and Vesta (6th house) so that will color how, what, where, why, and with whom Mars Pisces in the 3rd house operates. Astrology can get very complex and difficult. And this is why getting a professional consultation, connecting you to your unique life drama, will help you access the deep mysteries of astrology. For example, a report is unlikely to make all these cross-connections and then integrate the pieces of a puzzle into a whole picture. Looking at the whole chart will reveal the whole picture. * Even if everyone doesn’t have siblings (for example) they do have neighbors, co-workers, people or plants that are related to them in some way and whom they communicate at least a little bit of chit-chat here and there.